Two impressive comets will both reach their peak brightness during the second and third week of March 2013. 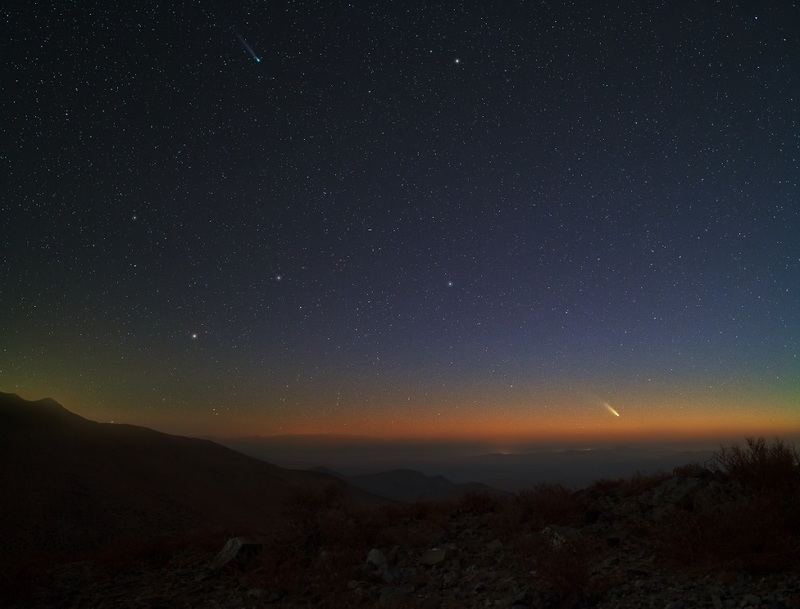 Taking advantage of a rare imaging opportunity, both of these comets were captured in the sky together last the Atacama desert in South America. Comet C/2012 F6 (Lemmon), visible on the upper left of the above image, is sporting a long tail dominated by glowing green ions. Comet C/2011 L4 (PanSTARRS), visible near the horizon on the lower right, is showing a bright tail dominated by dust reflecting sunlight. The tails of both comets point approximately toward the recently set Sun. Comet Lemmon will be just barely visible to the unaided eye before sunset in southern skies in the second week of March, and then best viewed with binoculars as it fades and moves slowly north. Comet PanSTARRS, however, will remain visible in southern skies for only a few more days, after which it will remain bright enough to be locatable with the unaided eye as it moves into northern skies. To find the giant melting snowball PanSTARRS, sky enthusiasts should look toward the western horizon just after sunset. Deep sky observers are also monitoring the brightening of Comet C/2012 S1 (ISON), which may become one of the brightest objects in the entire night sky toward the end of 2013.